Football GIF: Can Someone Please Explain The Weird Deflection On David Alaba’s Shot? Ain’t this just the weirdest-lookin’ deflection you ever did see? Anyone out there with a degree in physics/telekinesis explain how the ball can deflect right off the defender’s toe and still curl to the left? The deflection of the ball off the defender was only slight. The spin imparted on the ball when it hit the defender’s boot was enough to overcome the change in direction resulting from the ball hitting the boot, especially with the aid of a bounce off the turf. The ‘keeper may have been further fooled by the way Alaba hit the shot. If the ball had continued uninterrupted from his boot one could have reasonably expected it to curl the other way, towards the right hand post. Just think of a left footed curler from where the deflection took place. It wasnt enough to change the direction of the ball much but put lots of spin on it. Wot I find more impressive is tht it hits the penalty spot before it goes in ! Anyone else impressed that Gigi still almost got to it, especially after committing to the other direction (based on the initial shot)? After watching it live and looking at endless replays, he had it tracked all the way, it was the deflection/spin/aerophysics which took it into goal, and outside of his reach. I’ve watched it 20 times and it’s still pretty amazing. It looks like the defenders leg clips the “back” of the ball as its already gone past. This sets the clockwise spin going even faster than the initial shot. I mean, fast… spinning like a top. The effect this has is that the spin (The Magnus Effect) overcomes the deflection from right to left and actually curls it further to the right (from the kicker) than it would have gone in the first place. Try to ignore the bounce when watching it. You can see that if it had stayed in the air longer, it would have eventually curled to the same place. 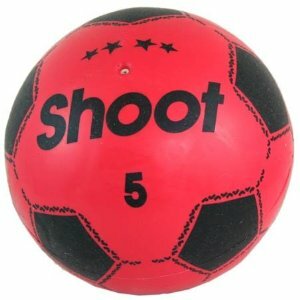 Ahhh shoot 5 plastic footballs are the best in the whole world!! I love them!